Make sure that the .git directory is located within the Runtime installation folder. The folder is hidden, so you must enable the Show All hidden folders option. Click Tools > Folder Options > View. If the folder does not exist, you must re-create it. For more information, see How do you re-create the git folder? If the folder exists, continue to the next step. The debug_mode parameter displays the Version Finder dialog. In the above example, the version of Robotic Automation Runtime in use is 6.2.12.0 and the local repo has not been initialized, which means that there was a failure to store the Robotic Automation Runtime repo locally on the machine. To display the list of branches that are stored on the local repo, click Show All Branches. If the list of branches is empty, reinstall Robotic Automation Updater. For more information, see How do you re-create the git folder? 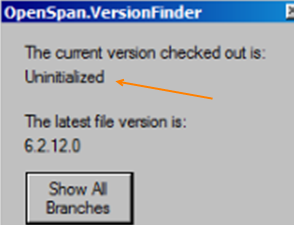 If some branches are listed, but not the one that you want, Robotic Automation Updater is failing to download the specified branch version. For additional instructions, and to ensure that the branch that you want is available, contact Robotic Automation Support.